Explanation: Serene skyviews were enjoyed across planet Earth earlier this week with a young crescent Moon low in the western sky just after sunset. 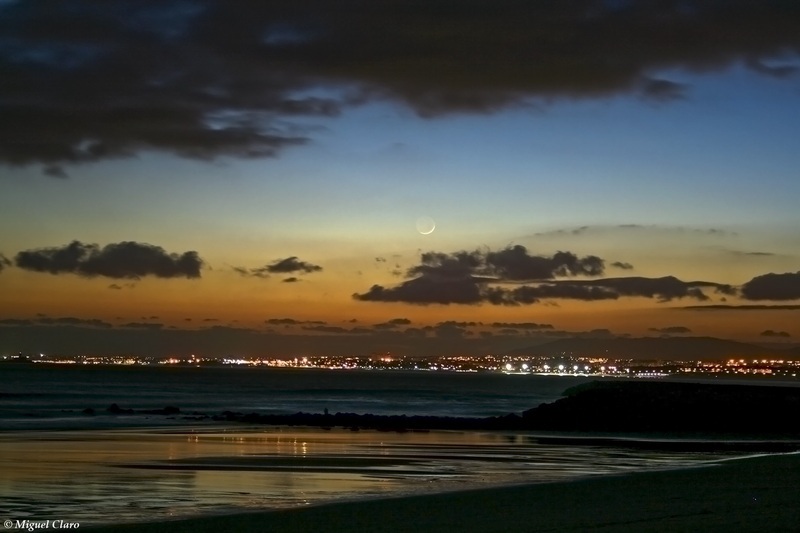 Recorded on June 4, this colorful example includes a quiet beach in the foreground with the city lights of Lisbon, Portugal, and the Sintra Mountains along the horizon. Posing between cloud banks, the Moon's slender, sunlit arc represents only about 1 percent of the full lunar disc. The rest of the Moon's nearside is faintly visible though, illuminated by Earthshine. A waxing crescent Moon should also create some lovely western skies at dusk this weekend. The bright star in the sky near tonight's (Saturday's) Moon will actually be the planet Mars. On Sunday the Moon will move closer to a pair of celestial beacons, bright star Regulus and Saturn.